What Does Code U1900 Mean? OBD II fault code U1900 is a manufacturer specific code that is defined by car maker Ford as “CAN COMMUNICATION BUS FAULT – RECEIVE ERROR”, and is set when the PCM (Powertrain Control Module) detects a communication failure between itself, the instrument cluster, ABS control module, and the trailer brake controller while the ignition is in the “RUN” position. Note that while the CAN (Controller Area Network) serial communication system connects all the control modules on a Ford application to each other, code U1900 (mostly) specifically refers ONLY to communication failures in the circuits within the greater CAN system that connect the PCM, ABS control module, and the instrument cluster. In simple terms, the CAN serial communication system is a high-speed communication system that allows all the control modules on the application to communicate and share data about operating conditions with each other via a highly complex wiring system. However, in practice, the CAN system consists of several interconnected sections in which information is first shared among the control modules in that particular section, before it is shared with other control modules in other sections. NOTE: As a practical matter, all control modules are programmed to both send and receive specific information that serves as a means to verify that both the sending and receiving modules are working as expected, as well as to identify the transmitting module. As stated elsewhere, the PCM, instrument cluster, ABS control module, and the trailer brake controller are connected with two specific CAN bus circuits, these being CAN circuits 1908 and 1909, which like all other CAN circuits, are not tolerant of faults. Therefore, poor connections (intermittent or permanent), short circuits, or abnormal voltages and/or resistances will be recognised as communication failures, which will set code U1900 and illuminate warning light on the first failure, although limited communication may still be possible under some circumstances. However, no part of, or circuit in, the CAN system exists entirely in isolation, and depending on the application, communication failures between other control modules that could include the Restraint Control Module, Parking Aid Module, and Four Wheel Drive (4WD) Control Module may contribute to the setting of code U1900. In fact, on Ford applications that are fitted with 4WD systems, the presence of code U1900 could cause the 4WD system (and others) not to function, which is a common feature of U1900 on many 4WD-equipped Ford applications. Note that in some cases, code U1900 can also cause a no-start condition, and particularly on F-series trucks. In terms of operation, the CAN bus system on Ford applications contains control modules that support three different communication protocols. For instance, some modules support the SCP (Standard Corporate Protocol), others support the ISO (International Standards Organization protocol, and still others, like the 4WD control module, supports the UBP (Uart Based Protocol). In practice, the different protocols serve different networks within the CAN system, and while this serves to decrease the complexity of the CAN system somewhat, it can make diagnosing issues very difficult. For instance, when a driver selects say, 4WD in low range, the 4WD control module needs to know the vehicle’s road speed, the status of the brake pedal, and the position of the manual lever (gear selector lever) before the 4WD control module will execute the transfer case shift. Since the above values are calculated or determined by the PCM, there is no need for each module to have its own dedicated vehicle speed -, or brake pedal position sensor, so the PCB distributes these values via the Standard Corporate Protocol network, which also allows for inter-protocol communication between control modules. Thus, the 4WD module (which “lives” on the Uart Based Protocol network), obtains the required data from the Standard Corporate Protocol network, and should the communication between the two different protocols be anything less than perfect, code U1900 can conceivably be set, even though CAN circuits 1908 an 1909 may be in perfect working order. Where is the U1900 sensor located? 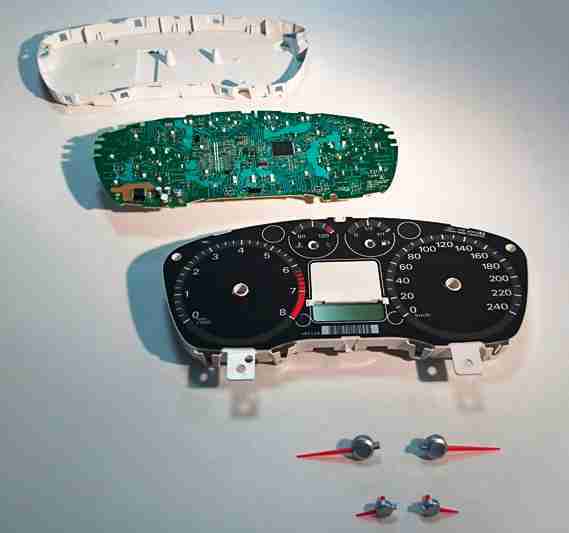 The image above shows the disassembled instrument cluster from a Ford Focus. Note that defective instrument clusters on many, if not most Ford applications, are among the leading causes of code U1900. Also, note that while defective Ford instrument clusters are often repairable, the process of diagnosing and actually repairing the defect is not recommended for non-professional mechanics. What are the common causes of code U1900? NOTE: Non-professional mechanics should take note that while code U1900 often has serious and sometimes, expensive-to-fix causes, the code can also appear as a so-called “ghost code”. In these cases, code U1900 can appear simply as the result of connecting a scanner to the data link connector while the ignition is switched on, or while the engine is running. Hello and thanks for the explanation. in the case of “Ghost Code” caused by connecting the scanner while the ignition is on, what is the possible fix? it is still required to disassemble the instrument cluster? or there is a simple fix for those cases. С вероятностью 95%на фокусах появились микротрещины олова на плате где втыкается кан шина. 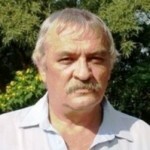 Нужно пропаять контакты заново.